Antoinette “Liz” Fourstar was born a fighter and stayed a fighter all the way into her last breath. On June 28th 2018 our beautiful and beloved Liz was called home at the Poplar Community Hospital while surrounded by her loved ones. Antoinette was born on March 13, 1966 to Adrian and Odessa Fourstar Sr. in Poplar, Montana. Antoinette was born in the middle of seven siblings. At the time of her passing she was the oldest living sister and was the rock of her family. 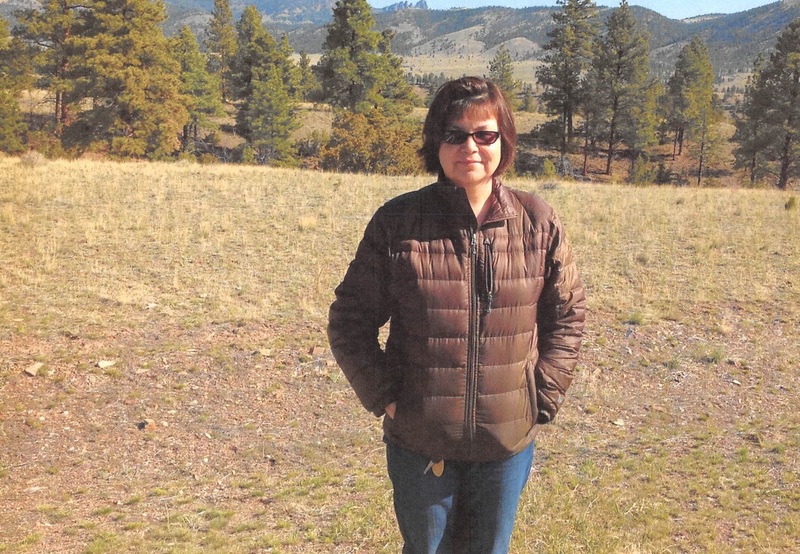 Liz was always known for her love of the outdoors where she would spend most of her life, whether it would be taking long walks or drive her car almost to the Canadian border she loved the open quiet country. She was a proud Frazer Bear Cub at which she played alongside her sister on the same basketball team in High School her favorite colors were the baby blue Bear Cub Colors and Silver. Liz was extremely proud of her years working as a fire fighter, fighting fires alongside her brother Jim. She was so humble she made the best of every job she had and the people she met in the process. Liz loved to read, travel, explore and stay active she had a love for horse riding, hiking and running she was almost always seen with her cowboy boots on and ready to ride. She had spent many of her years traveling with her daughter Charlie were she had met many people in the medical field whose friendships she cherished throughout her life. “There is so much for both of us to learn” Liz Fourstar, Charlie’s Mother. Liz’s thirst for knowledge was so vast she strived for education and always had an abundance of knowledge on anything and everything from how much sugar your drinks contained to how to fix a car while diagnosing and treating your illness’. In 2007 she had obtained her Associates of Arts degree in General Studies, in 2012 she had reached her Bachelor of Arts degree in Psychology. Liz was currently working on her Master’s Degree when she began to suffer from health problems. She enjoyed spending time with her family and friends telling stories and having deep conversations whether she was teaching or learning something new. Liz was a loving, caring and protective Friend, Cousin, Sister, Aunt, Grandma and most of all Mother she played many different roles in her life and was very supportive of those she loved. She loved her daughters Charlie, Adriann and Isabelle and her boy Pat who were her pride and joy. Liz could not be more proud of her daughter, she was often heard boasting about her baby girl and all her accomplishments. At the time of her passing Liz was currently residing in Poplar waiting for the day her baby girl had graduated from high school. Liz was brought up as a devout Catholic, and was a caring and giving person who will be missed by all who knew her. Liz is preceded in death by her daughters Charlie and Adriann Four Star, Parents Adrian Sr. and Odessa Four Star, Maternal Grandmother Isabelle Jones Paternal Grandparents Jerome “Buster” and Mabel Fourstar. Brothers Adrian “Bugsy” Fourstar, Michael “Chepa” Fourstar, James “Jim” Fourstar and sister Dolly Fourstar. Nephew Adrian “AJ” Fourstar and nieces Chelsea Fourstar and Regina Romero. Beautiful Liz, it was a wonderful and sacred ceremony today. I could feel your loving Spirit present as the Four Day Feast was going on. You are certainly going to be missed. All your relatives are welcoming you into the eternities and your Beloved Momma Odessa and beloved Daddy “Sweet Pea” Adrian are the happiest ones and your dear children. May our Wakan Tankan bless and comfort your Fourstar Tiwahe this evening hour. We will se you again beautiful Liz. We will miss you until that time. Loads of thoughts and prayers for your family. So sorry for your loss. I always enjoyed having Liz come in visit at the Library. Condolences, to the family of Liz, prayers for the Family. Liz, rest in peace. Thanks for stopping by to visit and checking on me. I will miss you. Say hello to Dolly. Sincere condolences to Janet, Jerry and all the relatives on the loss of their loved one. Prayers for all. My prayers and condolences to your family. Tell Charlie hi for me. “Achey breaky heart” is now fixed. Dolly Denise, miss you until we meet again..
Oh Liz, how I miss you. I’ve tried to find you for years only to find confirmation of this. It makes my heart hurt. I wanted to say hello once again & tell you I think of you & Charlie often. Thought of your firefighting and how proud you must be. You’ll both be forever on my mind and always in my heart. Tahu my friend. May the Great Spirit guide your journey.